UNIVERSAL WASHER PUMP 24v Universal Windscreen Washer Pump For Car, Van, Bus, Truck It will fit almost any 24v car or vehicle. Suitable for applications other than just car or motorcycle (really anything with 24v to pump water or other liquid) FAST DISPATCH. 100% Brand New. A perfect replacement for the old Wiper Arm & Blade of your car. Suitable for:Audi A3 8P 20013-2013 Before purchasing please check your original blade looks the same as the picture – especially the clip part. These are made to original equipment standard and should look exactly the same. THIS VEHICLE SERIES HAS 2 DIFFERENT APPLICABLE WIPER MODELS. PLEASE COMPARE THE PARTS CAREFULLY Note: This item DOES NOT FIT S-LINE. Blade length 34.5cm Arm length 44cm Diameter narrow 8mm Diameter wide 10mm Country/Region of Manufacture Hong Kong Placement on Vehicle Rear Classic Car Part Yes Brand Unbranded/Generic MPN DE702921687987 Manufacturer Part Number Does not apply EAN 702921687987. Nice car exterior decorative accessory for Suzuki Vitara 16-18. Back with self adhesive double sided tape, no harm to your car, easy to attach it to car and won't peel off. 3 Rear Window Wiper Cover. Fits for VAUXHALL (Opel) ASTRA G MK4 1998-2005 Version: HATCHBACK Length of blade: approx. 405mm Length of arm: approx. 450mm Please check the production year and version before you bidding! Classic Car Part Yes Country/Region of Manufacture Hong Kong Placement on Vehicle Rear Brand Unbranded MPN WO735548205937 Manufacturer Part Number Does not apply EAN 0713239799798. 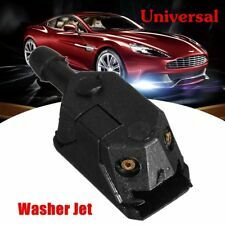 Universal Black Car Blade Arm Washer Wiper Water Spray Jet Nozzle 9mm 4mm New. 1x Washer Jet. Application: Universal Car. Position: Driver, Passenger, Rear. Color: Black. We will try our best to reduce the risk of the custom duties. GENUINE BOSCH QUALITY WIPER BLADES. 100% Brand New. A perfect replacement for the old Wiper Arm & Blade of your car. Suitable for:Audi A3 8P 20013-2013 Before purchasing please check your original blade looks the same as the picture – especially the clip part. These are made to original equipment standard and should look exactly the same. THIS VEHICLE SERIES HAS 2 DIFFERENT APPLICABLE WIPER MODELS. PLEASE COMPARE THE PARTS CAREFULLY Note: This item DOES NOT FIT S-LINE. Blade length 34.5cm Arm length 44cm Diameter narrow 8mm Diameter wide 10mm Country/Region of Manufacture Hong Kong Placement on Vehicle Rear Classic Car Part Yes Brand Unbranded/Generic MPN BL702921688335 Manufacturer Part Number Does not apply EAN 702921688335. This valve is used in many passenger cars and trucks in the front and rear wash. It prevents the back flow of the washing water for long distances or at high altitudes, such as in the truck or the van and thereby causes a rapid water outlet to the washer nozzles. Car: VAUXHALL (Opel) Combo C. Vauxhall Opel Corsa C. Vauxhall Opel Combo C. Item: rear wiper arm with blade. Length wiper blade: 406 mm. version without washer. To other countries we can also send, but this costs will be different and to avoid misunderstandings You should ask about them before You buy. Car: Suzuki Liana. Item: rear wiper arm with blade. Length wiper blade: 250 mm. version without washer. To other countries we can also send, but this costs will be different and to avoid misunderstandings You should ask about them before You buy. 100% Brand New. Suitable for: Mercedes A Class MK2 (W169) 2005-2012 Blade Length: 310mm Arm length: 355mm Please read all the information before purchase Arm length 355mm Material ABS & Rubber Country/Region of Manufacture Hong Kong Blade Length 300mm Classic Car Part Yes Placement on Vehicle Rear Brand OTOTEC MPN 0702921738160 Manufacturer Part Number Does not apply. Front Wiper Arm For BMW 5 6 E60 E61 E63 E64 61617185366 7185366. For BMW E60 E61 E63 E64 WIPER ARM 61617185366 （Only fit for LHD）. -Perfect to replace your old window wiper arm. 1 x Window Wiper Arm. 100% Brand New. Suitable for: Mercedes A Class MK2 (W169) 2005-2012 Blade Length: 310mm Arm length: 355mm Please read all the information before purchase Arm length 355mm Material ABS & Rubber Country/Region of Manufacture Hong Kong Blade Length 300mm Classic Car Part Yes Placement on Vehicle Rear Brand Unbranded/Generic MPN OX702921737514 Manufacturer Part Number Does not apply EAN 702921737514. 100% Brand New. A perfect replacement for the old Wiper Arm & Blade of your car. Suitable for:Audi A3 8P 20013-2013 Before purchasing please check your original blade looks the same as the picture – especially the clip part. These are made to original equipment standard and should look exactly the same. THIS VEHICLE SERIES HAS 2 DIFFERENT APPLICABLE WIPER MODELS. PLEASE COMPARE THE PARTS CAREFULLY Note: This item DOES NOT FIT S-LINE. Brand Unbranded Manufacturer Part Number Does not apply. 100% brand new and OEM Quality Blade length 275mm Arm length 270mm Fit for: Citroen C2 Before purchasing please check your original blade looks the same as the picture – especially the clip part. Size(in. )Blade length 11” Fit for Citroen C2 2003 onwards Type Frameless Country/Region of Manufacture Hong Kong Quantity Sold Individually Placement on Vehicle Rear EAN Does not apply Brand Unbranded MPN HD0735548159612 EAN 735548159612 EAN Does not apply Brand Unbranded/Generic EAN 735548159612 Manufacturer Part Number Does not apply. 100% brand new and OEM Quality Blade length 325mm Arm length 290mm Fit for: Audi A3 2003 onwards（Engine code 8P1 8PA） Audi A3 2012 onwards（Engine code 8V1 8VA） Also fit for A4 B6 B7 ESTATE 2001-2008 Before purchasing please check your original blade looks the same as the picture – especially the clip part. These are made to original equipment standard and should look exactly the same. Blade length 325mm Arm length 290mm Warranty Yes Country/Region of Manufacture Hong Kong Wiper Blade Type Standard Classic Car Part Yes Placement on Vehicle Rear Brand Unbranded MPN ES735548181842 EAN 735548181842. FLAT FX AERO WIPER BLADES. Retro Fit aero flat FX windscreen wiper conversion set. As our FX wipers use a full length integrated spoiler they are different for Left Hand Drive or Right Hand Drive cars. Fit for DODGE Grand Caravan. wiper motor shaft or the new arm will not fit! Pls check the pic and make sure the wiper is you wanted. Wiper arm length: 31cm. Blade: Rubber. To prevent the wiper turn into white in insolation. Car: MAZDA 6 (Combi / Estate ). Item: rear wiper arm with blade. Length wiper blade: 305 mm. version without washer. To other countries we can also send, but this costs will be different and to avoid misunderstandings You should ask about them before You buy. 100% Brand New. Suitable for: Mercedes A Class MK2 (W169) 2005-2012 Blade Length: 310mm Arm length: 355mm Please read all the information before purchase Arm length 355mm Material ABS & Rubber Country/Region of Manufacture Hong Kong Blade Length 300mm Classic Car Part Yes Placement on Vehicle Rear Brand Unbranded/Generic MPN Does not apply Manufacturer Part Number Does not apply EAN 4894669041926. Fits for VAUXHALL (Opel) ASTRA G MK4 1998-2005 Version: HATCHBACK Length of blade: approx. 405mm Length of arm: approx. 450mm Please check the production year and version before you bidding! Classic Car Part Yes Country/Region of Manufacture Hong Kong Placement on Vehicle Rear Brand Unbranded MPN ES735548180449 EAN 735548180449. VAUXHALL 90356178. VAUXHALL COMBO Mk I (B) (S93) 1.2 07.94 - 10.01 33 45 1195 Box. VAUXHALL COMBO Mk I (B) (S93) 1.4 07.94 - 10.01 44 60 1389 Box. VAUXHALL COMBO Mk I (B) (S93) 1.4 07.94 - 10.01 60 82 1389 Box. 100% brand new and OEM Quality Blade length 12” Fit for: Peugeot 107 /Citroen C1/ Toyota Aygo Before purchasing please check your original blade looks the same as the picture – especially the clip part. Fit for Peugeot 107 /Citroen C1/ Toyota Aygo Peugeot 107 2005 Onwards Citroen C1 2005 Onwards Toyota Aygo 2005-2014 Type Frameless Classic Car Part Rear Size(in.) 12” Compatible Arm Type Pin Arms Quantity Set of 2 Warranty Yes EAN Does not apply Brand Unbranded Country/Region of Manufacture Hong Kong Manufacturer Part Number Does not apply. Model: 1 Series F20. Picture is for reference only and shows precise item. Position on Vehicle: Right. Add to Favourites. O.E Number: 61677275658, 61677380422. We are happy to help you with this process. Car: Nissan Murano. Item: rear wiper arm with blade. Length wiper blade: 305 mm. version without washer. To other countries we can also send, but this costs will be different and to avoid misunderstandings You should ask about them before You buy. Model -Honda Civic 5dr & Tourer. Part -Screen wash bottle cap. Honda OE part no.-76802-TV0-E01. Model Year -2012 > Present. 100% Brand New. Suitable for: Mercedes A Class MK1 (W168) 1998-2005 Length: 330mm Blade only, no arm Please read all the information before purchase Length 330mm Material Steel & Rubber Country/Region of Manufacture Hong Kong Placement on Vehicle Rear Classic Car Part Yes Brand OTOTEC MPN ES702921727157 Manufacturer Part Number Does not apply EAN 702921727157. FIAT PUNTO 1999-2005. These Aero Wipers Feature a. One Pair Of Front Flat Wiper Blades To Suit IT ONLY FIT THE TRADITIONAL WIPER ARM WITH HOOK ON THE END . Driver Side Blade → 22". Passenger Side Blade. WIPER REFILLS Pair of quality cut to size refills Why change the whole unit when all you may need is a replacement rubber. 28 inch long 6.5mm wide. 100% rubber and silicone. Silent non squeak streak free. Easy fit. 2 refills supplied. Just cut to the size of your originals then slide them in. One piece blades, you do not need to re-use the wire rods from the OEM blade. Please check the width of your existing blades to ensure that it's 6.5mm width to ensure this replacement will slide in. Can be used for front or rear and helps to pass the MOT PLEASE NOTE Important notice BEFORE ordering Please DO NOT rely on the compatibility list to make your decision of parts, as cars come with many variations and fitments on the same make and models. Check things like dimensions. Item: 100% brand new Length wiper blade: 350 mm Car: Renault Megane Scenic Version: version without washer Production year: 1996-2003 Producer/Quality: high class of replacement Rear wiper blade and arm with cap Classic Car Part Yes Country/Region of Manufacture Hong Kong Placement on Vehicle Rear Brand Unbranded MPN WO735548206132 EAN 735548206132. Wide Range Of Quality Wipers Sold Here! UK Seller! Wipex Universal Washer Wiper Arm Blade jet . 100% brand new and OEM Quality Blade length 360mm Arm length 325mm Fit for: Citroen C3 Before purchasing please check your original blade looks the same as the picture – especially the clip part. Size(in.) Blade length 14” Fit for Citroen C3 2002-2009 Type Frameless Country/Region of Manufacture Hong Kong Warranty No Quantity Sold Individually Classic Car Part Yes Placement on Vehicle Rear EAN Does not apply Brand Unbranded MPN WO735548209829. Washer Nozzle Heated Right Audi A3/A3 Sportback 8p1 8pa Yr. Part number: 8P0955988. Year 8P1 07/2003-2012. Audi A3 / A3 Sportback. Windscreen Washer Nozzle. Key number to 3: 842. Key number to 2: 0588. If your Audi A3 or A4 your windscreen wiper motor linkage is worn and popping off this will prevent it. (12mm joints only) It is very easy to fit our Wiper Linkage Repair Clip, if you can see the linkage, it can be fitted it in minutes, you do not need to remove the motor or linkage from the car. Fitting Instructions https://youtu.be/dnItirjdGVs. Land Rover Part Number : AMR3915. for the RANGE ROVER P38 (1995 - 2002). FRONT WINDSCREEN WIPER SPINDLE CAP. LAND ROVER FREELANDER (1996 - 2006). GENUINE LAND ROVER part so you may be confident that it will give you proper service. Equivalent to Land Rover AMR3026 (used for reference only). PARTS >> ACCESSORIES >> DEFENDER SERIES DISCOVERY 1 1989 to 1998 DISCOVERY 2 1999 to 2003 DISCOVERY 3 2005 to 2009 DISCOVERY 4 2010 to 2016 DISCOVERY SPORT 2015 on FREELANDER 1 1996 to 2006 FREELANDER 2 2006 to 2014 RANGE ROVER CLASSIC RANGE ROVER P38 RANGE ROVER L322 2002 to 2012 RANGE ROVER L405 2013 on RANGE ROVER SPORT RANGE ROVER EVOQUE UPGRADES >> TOOLS,OILS AND OTHER DIY >> Books Manuals and Gifts. Brand new Fit for: SEAT Leon 55 06 56 07 57 08 58 09 59 10 60 11 61 12 62 Production year: 2009 onwards (White Car), 2005 to 2009 (Black Car) Notice: If your car is near the start or end dates remove blade and check against the picture Suitable For: SEAT Leon 55 06 56 07 57 08 58 09 59 10 60 11 61 12 62 with production year 2009 onwards (White Car), 2005 to 2009 (Black Car) Arm Length 260mm Blade Length 285mm Warranty Yes Country/Region of Manufacture Hong Kong Wiper Arm Type Universal/Side Pin EAN Does not apply MPN Does not apply Brand Unbranded Manufacturer Part Number Does not apply EAN 735548158899 EAN 735548158899 EAN Does not apply MPN BL735548158899. GENUINE VAUXHALL / OPEL GROMMET Part Number: 90276310 Compatibility: .......TO BE ADDED...... PLEASE MESSAGE WITH VEHICLE REGISTRATION OR CHASSIS NUMBER TO CHECK COMPATIBILITY. NOTE: The ebay compatibility table above is intended for guidance purposes only. Please check part numbers and/ or contact us with your vehicle registration or chassis number to confirm compatibility. VAT Invoice included 1 Year Vauxhall Warranty Included Thanks!.